The Holy Qur’an draws attention to observance of Salat in many places. At times it gives commandment to safeguard Salat, other times it gives commandment to be regular in Salat and it also gives commandment to offer Salat on time. In short, God has instructed true believers repeatedly towards observance of Salat and its excellence and above all has stated: ‘And I have not created the Jinn and the men but that they may worship Me.’ (51:57) But man does not recognise this and is distant. The Promised Messiah (on whom be peace) said that God has created you for the purpose of worshipping Him. Those who do not follow this simply eat and drink and sleep like animals and lose out on God’s grace. Whereas a person who claims to have faith should try their utmost to become recipient of God’s grace. How does one fulfil the purpose of worship of God? Islam commands five daily Prayers for this. A Hadith relates that Salat is the core of worship of God. We are fortunate to have accepted the Imam of the age who taught us the correct ways of worship of God, and gave us the wisdom into the requisite of worship. He repeatedly drew attention of his Jama’at to this matter in detail so that we would understand its significance and would adorn our worship of God. At times due to severe weather or owing to shorter nights attendance can be low at the time of Fajr Salat. Or people combine their Zuhr and Asr Salat. So, owing to severe weather, not having enough sleep due to short nights, or being busy in work people either miss offering Salat or combine them. These days the Salat time in these countries is going backwards and at the time of Fajr Salat there is a decrease of one and half row [at mosque]. Sometimes the numbers increase because of visitors from abroad but the locals, who live close by should come to the mosque regularly for Salat especially for Fajr Salat. This should not be just here [in the UK] but everywhere in the world. Much improvement can be made in this regard if office-holders and life-devotees pay attention to this. The Promised Messiah (on whom be peace) said that God does what He wills. The city of Babylon for which man had great plans was made desolate and turned into a ghost town but the place [Mecca] which man wanted to be desolate became the hub for people all over the world. The Promised Messiah (on whom be peace) said that Salat is a special form of supplication but people take it as if it is like a levy charged by the government. They are foolish and do not realise that God is not in need of man to glorify Him and to declare that there is none worthy of worship save Him. These matters are for man’s own good and advantage. The Promised Messiah expressed sadness that people are not drawn to worship of God and righteousness and love of religion anymore. This is owing to the pernicious effect of cultural rituals which have cooled off love of God. People do not derive the kind of pleasure in worship of God as they should. There is nothing in life in which God has not placed an element of pleasure and delight. Just as an ailing person does not enjoy fine foods and finds them bitter or insipid, people who do not experience delight in worship of God should be concerned about their spiritual ailment. God has created man to worship Him, so how could it be that there would be no element of delight and pleasure in His worship! Indeed there is pleasure in it if only there were people to delight in this. God has stated: ‘And I have not created the Jinn and the men but that they may worship Me.’. Since man was created to worship God it was essential that worship of God had delight and pleasure in it. This can be understood very well by everyday experiences. Food has been created for man and it gives pleasure and delight. And for this man has been given the sense of taste. Likewise, man derives pleasure by watching beauty in nature, animals etc. and by listening to melodious, pleasant sounds. What more could be needed to prove that there is delight in worship of God! The Promised Messiah (on whom be peace) said people are negligent about Salat because they are not aware of the pleasure and delight that God has placed in it. He said question arises why are people not aware of this and why have they not experienced this delight! 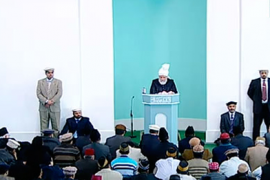 He said people are occupied in their tasks when the call for Prayer is made and people do not want to know. There are shopkeepers with shops adjacent to mosques but they do not attend. Thus one should pray most soulfully to God that just as He has given us the delights and pleasures of foods and other things, may He also grant us the delight in His worship. Those who do not offer Salat consider it as a burden which entails getting up in the morning and doing ablutions in the cold, leaving blissful sleep and other comforts. Such people are weary and do not know of the delight and pleasure that is found in Salat. An alcoholic does not give up drinking because he cannot get drunk but goes on drinking till he begins to feel the effect and delight that he desires in liquor. A wise person can learn from this and continue offering Salat until such time that he experiences delight in it. Just as an alcohol drinker seeks to find delight in alcohol and it is his objective, similarly one should be inclined with complete focus to attain delight in Salat. And then supplicate with resolve and earnestness in the manner of the anxiety and anguish of the drinker to attain the delight. This would be mostly truly enable one to experience the said delight. The Promised Messiah (on whom be peace) said that it is important to offer Salat while being mindful of its words as well as being mindful of the physical state in which it is offered. Words of Salat correspond with its different postures. The posture when one stands up in Salat and glorifies and praises God is called qiyyam [this Urdu word can also signify ‘to establish’]. The appropriate position to submit glorification and praise is indeed in a standing posture. When eulogies are read to kings it is done in a standing position. Thus in Salat, during qiyyam one is standing before God in a spiritual sense. Praise is given when one is convinced about something and a person praises something having arrived at a viewpoint. Thus a person saying Alhamdolillah (all praise belongs to God) will only truly say Alhamdolillah when he is completely convinced that all manner of acclaim belongs to God alone. When one is convinced on this with one’s heart and mind, this is a state of spiritual qiyyam. The Promised Messiah (on whom be peace) said that it is worth remembering that Salat which is Salat in the true sense is attained through prayer. It is totally against the ethos and honour of a true believer to seek from anyone save God. Unless one asks God in complete humility and only asks Him he is not worthy of being called a true Muslim. The reality of Islam is that all one’s inner and external faculties submit to God. Just as all the components of a large engine operate on the power of the engine, likewise unless a person makes all one’s actions subservient to the high power of the Engine, how can he be really convinced of the Divineness of God and can truly consider himself as a hanif [one who is ever inclined to God] when uttering: ‘I have turned my face towards Him Who created the heavens and the earth…’, If he is inclined to God just as he utters, then no doubt he is a Muslim. He is a true believer and a hanif. However, he who who turns to others besides God should remember that he is most unfortunate and a time will come when he will not be able to turn to God in a pretentious manner. One reason people give up Salat is also this that when man turns to others besides God his heart and soul is also drawn to that source just as branches of a shrub or tree are trained to grow in a certain direction. His heart develops severity towards God and makes him stony and cold and he cannot change his direction and his heart and soul grow distant from God by the day. This is a dangerous and frightening matter that man should leave God and seek from another. This is why observance and regularity in Salat is very important so that it is established as an enduring habit and one is mindful of turning to God. Gradually the stage also comes when one is completely devoted to God and is the recipient of a light and a delight. Funeral Prayer in absentia was announced for Asghari Begum Sahiba, wife of Sheikh Rehmatullah Sahib, Amir Jama’at Karachi. She passed away on 27 March at the age of 90 in USA following brief illness. Her nikah to Sheikh Rehmatullah Sahib took place in 1943 and she accepted Ahmadiyyat in Lahore in 1944 at the hand of Hazrat Musleh Maud (may Allah be pleased with him). She accepted Ahmadiyyat before her husband. She fulfilled her pledge to Khilafat with complete honesty all her life and always advised her children to remain connected to Khilafat. She had great reverence for Khilafat. Since its inception, watching MTA was her favourite pastime. She was a moosia, a most steadfast person with keen sense of gratitude. She was prayerful, observed Tahajjud and was regular in observing Salat and fasting and recitation of the Holy Qur’an. During the time her husband was privileged to serve in Karachi she also served shoulder to shoulder with him. She was a most hospitable person. When Sheikh Sahib was Amir Jama’at Karachi, among all other activities she fulfilled the responsibility hosting guests a great deal and had the honour to play host to Hazrat Khalifatul Masih II (may Allah be pleased with him) Hazrat Khalifatul Masih III and Hazrat Khalifatul Masih IV (may Allah have mercy on them). She was at the forefront of making financial sacrifices. Once in 1950 the Jama’at went through a time of financial constraints and Hazrat Khalifatul Masih II (may Allah be pleased with him) made special appeal. Following this her husband gave a large portion of his income to the Jama’at and she was also regular in making sacrifices with him. She lived a very simple life free from affectations. Her son writes that she always advised her children to write letters to Hazrat Khalifatul Masih requesting prayers. She leaves behind five sons and two daughters and 43 grandchildren and great grandchildren. Dr Nasim Rehmatullah Sahib, Naib Amir USA and in-charge of our website alislam.org is one of her sons. Her son-in-law Rehmani Sahib has lived here in UK for a long time and served as Secretary Wasiyyat UK Jama’at for a long time.His wife Jamila Rehmani has served as Secretary Maal in her local branch and has also served/or is serving in other capacities. A son, Farhatullah Sheikh Sahib is Naib Amir of Faisalabad, Pakistan. May God elevate the station of the deceased and keep her children and generations connected to Khilafat!